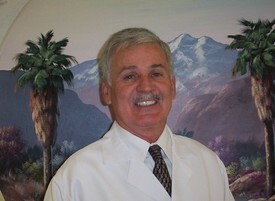 Meet Dr. Mobley | Rancho Mirage, CA | Mark A. Mobley, DDS, Prof. C Corp.
Dr. Mobley was born in England and graduated from High School in 1977 in San Bernardino, California, where he received a full Scholarship to Loma Linda University. He earned a Bachelor of Science Degree from Loma Linda University where he was named to the Who's Who in America Colleges and Universities. After graduating in the top third of his class from Loma Linda University School of Dentistry in 1985, he completed a hospital residency at Jerry Pettis Memorial Veterans Hospital. Dr. Mobley continues to stay at the forefront of the latest technology and advances in dental care by completing numerous continuing educations each year, which requires examination for knowledge and ability by the best of his profession. An avid hiker and mountain climber, Dr. Mobley appreciates the opportunities and blessings of the community. He is also involved in and regularly contributes to various local Philanthropies.